Do you have a guest DJ with specific rider requirements? Are you a DJ who wants to try out the latest kit? We have a range of DVS systems to hire. If there is something you are after please drop us a message we will be glad to help. 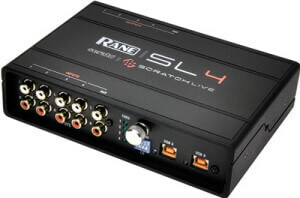 The Rane SL3 for Serato Scratch Live. Compact 2-deck plug-and-play USB interface adds DVS and auxiliary I/O to any mixer. 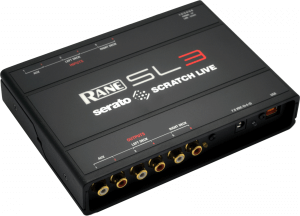 The Rane Serato Scratch Live SL3 gives you the freedom to take your entire digital music collection on the road with advanced Serato Scratch Live features that add extra creativity to your DJing. This intuitive system replicates the traditional DJing experience for “real feel” usability. The Rane SL3 USB 2.0 interface connects one, two or three standard vinyl or CD turntables to your computer using a single USB cable with audio connections to line inputs on your DJ mixer of choice. Teamed with low latency ASIO and Core Audio drivers, the SL4 can also be used as a high-grade studio production tool.